Along the southern flank of the African continent is one of the true iconic destinations in the world: South Africa. Don't let those world maps fool you, South Africa is a big country and is approximately 3x bigger than California. You will be spoiled for choice and time will be your most precious commodity. For those seeking an uber luxurious experience, South African is laden with bespoke safari private game reserves and blessed with some of the most beautiful vineyard estates in the world. For those who are looking for active pursuits, there are beautiful hikes with stunning and sublime views scattered throughout the country. For thrill seekers, there are some unique experiences where you can go great white shark-diving, ostrich-riding, and bungee-jumping. For sun seekers, there are some gorgeous beaches in Cape Town and Durban. For those seeking a leisurely drive, there are some amazing coastal drives to experience along the Cape of Good Hope or Garden Route. Given its culinary influences from Africa/Europe/Asia, there is always some amazing food to pique your taste buds. And for those who want to learn about the long and difficult struggle to end apartheid, there are numerous places to educate and learn about South Africa's painful and rich history. While you may not be able to do it all on one trip, we can definitely help you create your own short-list and maximize your voyage. In this introduction, we will spotlight what really stood out to us during our painstaking research. By underscoring these items, we know you can then create a rough sketch of what you may want to do so you can make your own outline of when to go, where to explore, and how many days you may want to take. We spent 12 days in South Africa and although we couldn't do everything on this list, we felt we had an experience that would last a lifetime. We will point out everything we had researched including things that we didn't get a chance to do. We hope this introduction whets your appetite and inspires your own search for your unique African holiday. In upcoming posts, we will go into greater detail over many of these items including Safaris, Cape Winelands, Cape of Good Hope Drive, and Greater Cape Town Hiking/Dining/Excursions. Italicized items are things we did. Given the size of the country, each area has an unique climate. So for the experiences we did we will list what time of the year is best to go. For reference, we went in May. Throughout the African continent, there are some amazing safari experiences including South Africa, Kenya, Tanzania, Namibia, Botswana, etc. While you can't go wrong with any of these places, the proximity to all of these attractions (safari and otherwise) makes South Africa a great choice for your first safari voyage to see the "Big 5" (lions, leopards, elephants, rhinos, and cape buffaloes) and so much more! We will have an upcoming Safari post to explain the particulars of preparing for the safari and explaining the private game reserves. We chose to do stay in a lodge at the SABI SANDS Private Game Reserve outside of KRUGER NATIONAL PARK. We recommend AT LEAST 3 nights for safari (We did 4 nights). If you have the time, its definitely worth renting a car and trying either the Cape of Good Hope drive (1 day round-trip drive) or the Garden Route (multi-day drive). We did the CAPE OF GOOD HOPE drive which we explore in detail in this post: http://www.seekingsky.com/blog/2017/10/26/south-africa-cape-of-good-hope-drive Remember you will have to drive on the left side of the road. We were fortunate that it did not rain on our day trip along Cape of Good Hope when we went in May. Please note that June-July are the rainiest months (August and May also have an increased chance of rain) along the Cape of Good Hope and Garden routes. Cape of Good Hope drive is day-long loop drive that leaves from and returns back to Cape Town. Along the drive, you will see the colorful beach houses along St. James Beach, then go to Boulder's Beach to see the penguins frolicking, step on to the southwestern tip of the African continent at the Cape of Good Hope, and a return back to Cape Town along the gorgeous Chapman's Peak. Cape of Good Hope drive highlighting some of the stops. We began our stay at the Derwent House. The time required is obviously much greater than shown as you will undoubtedly stop and explore at each stop. You are also likely to hit some occasional traffic as some of the roads are one-lane. I can imagine that in a country this vast, there are an incalculable and myriad places to hike and explore. Far be it for me as a tourist to know the most gorgeous places. But in our research a few places did stick out, although our choices were tempered by practical considerations. Greater Cape Town Area - As our trip was centered in the Greater Cape Town Area, we did an easy hike at KLOOF CORNER, a medium hike at LION's HEAD, and took the cable car up TABLE MOUNTAIN. Each has its own charm and all are amazingly beautiful. We will highlight these in a future post about Cape Town. Throughout this great country, there are innumerable great beaches. But if you are visiting a city and want a city with beach access, it is important to understand the currents. Remember, if you are going with the primary intention of enjoying the sun and the beach to time your trip for the Southern Hemisphere summer. The greater Cape Town area has some great beaches to get some sun with beautiful views of the surrounding mountainous topography. Beaches in this area include Camps Bay, Clifton, Blouberg, Muizenberg, etc. No matter when you go (even in the South African summer - Dec-Jan), the water here is still going to be cold because it is bathed by cold Antarctic Benguela current. If you want to go in the water itself, you will need a certain tolerance or wetsuit. 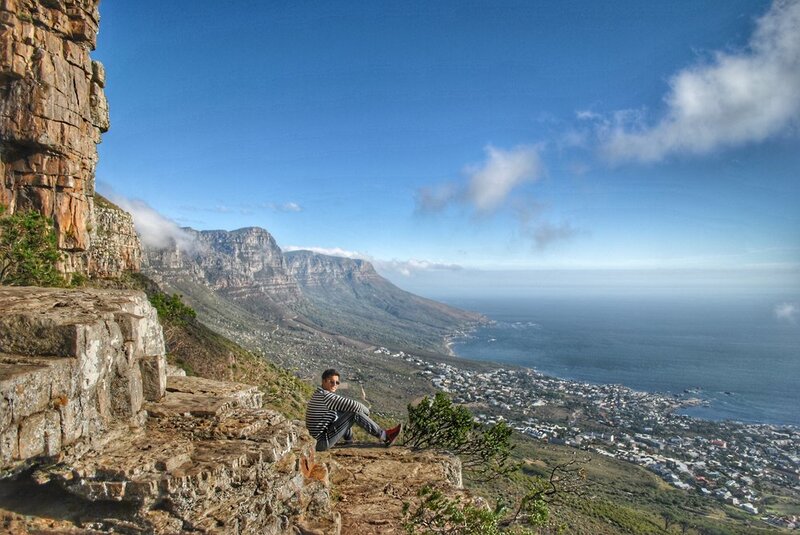 We will highlight some our favorites in upcoming posts about Cape Town. We will also of course touch on Great White Shark Diving in our Greater Cape Town post. As of the time of this writing, there are no direct flights between the US and Cape Town. You generally have to connect through Europe, Middle East, or Johannesburg (Jo-burg). When booking internal flights within South Africa, please pay particular attention to how the booking is made in terms of the airlines/subsidiary. Codeshare flights do not seem to operate the same way they do in the US. An example: we booked a flight on South African Airways website from Cape Town to Jo-burg to Nelspruit (the airport close to Kruger) all on one booking/itinerary. The Cape Town to Jo-burg flight was operated and code-shared by Mango Airlines. The Jo-burg to Nelspruit flight was strictly operated by South African Airways. Despite both flights being on one booking, they wanted us to pick up our bags and check them back in at Jo-burg as they were being treated as bookings from two different airlines. Given our short connection, this became a huge headache. Moral of the story, try to get everything booked AND operated by a single airlines if you have to make a stop on an internal flight. Better yet, if the timings work, pay up for the direct internal flight. When in Cape Town, always use UBER. It is safe and VERY CHEAP. If you plan on explore the Cape Winelands or considering the Cape of Good Hope or Garden Route drives, definitely rent a car. It is much better to explore these things on your own so you may do things that interest you at your own pace and schedule. 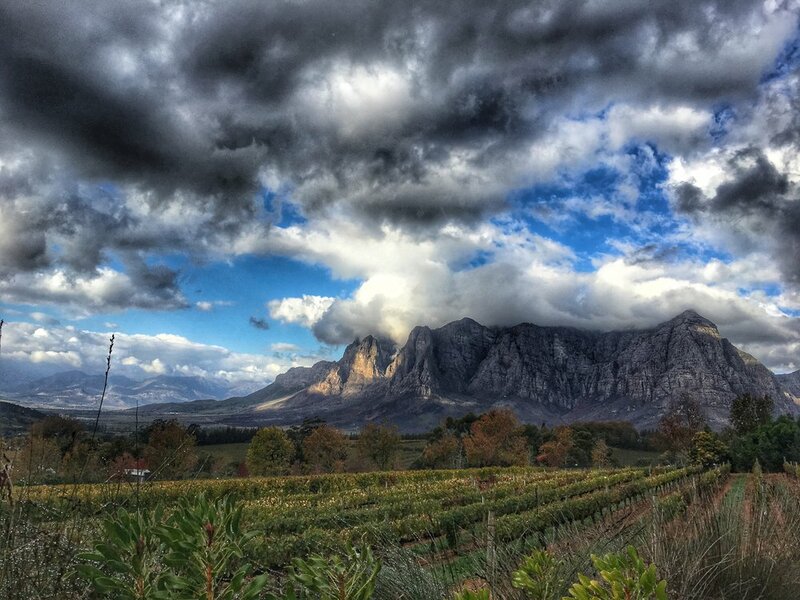 Once in Stellenbosch, there is UBER if you want to sip and explore different vineyards. There are less UBER drivers here so the wait times and prices are more than Cape Town but still very reasonable. The travel/health tips are going to be written from the perspective of an US traveler. We urge you to talk to your doctor or travel clinic before travelling to South Africa. We are of course not your physician and are not responsible for health advice. Consult a travel clinic or your doctor to make sure your routine vaccinations are up-to-date. Other vaccines that are recommended include Typhoid and Hepatitis A/B.